I have been suffering from hardened, transparent plugs clogging my pores (sometimes becoming pimples) in my face for a long time. I always assumed this was hardened sebum and/or dead skin cells, as this is what you often read. Though it's also said that the reasons for acne and/or clogged pores are not really well understood. I would like to mention another (potential) cause that I stumbled into, after all the regular treatments I tried never have been able to fully resolve my clogged pores. I than looked up what the milia plugs are actually made of and found out it is keratin. Keratin is a protein that is part of the outer layers of your skin. Nails and hair are also (partly) made up of keratin. It's therefore not surprising that keratin plugs are very hard and difficult to get rid of. The usual treatments mentioned are salicyclic acid and retanoids but my results were inadequate. I therefore searched for what else could dissolve keratin and some sites mentioned urea. Creams with urea are in my country routinely recommended or prescribed for dry skin, as urea hydrates and heals the skin (urea is part of your skin). Urea creams in higher concentration are also prescribed for skin conditions like keratosis pilaris, which is actually a buildup of keratin clogging pores on body parts, but it sounded very similar to what I am suffering from in my face. So I decided to try a cream with urea. i started with a regular one with 10% urea that is sold for dry skin. I than tried urea creams in higher concentrations: one with 20% and one with 30%. The last one with 30% also contains salicyclic acid and seems to work very well. It is sold as cream for ''keratosis prone and scaly skin''. I have been using it fro several weeks now, and I can clearly notice and feel that the plugs underneath my skin are dissolving. It works better than anything else I have tried and the nice thing about it is that it dissolves the plugs, and not pushes them out causing pimples as with retinoids. The additional benefit of urea is that it does not irritate at all, even in higher concentration (though I would be careful with this). In fact, urea does wonders for my skin, in particular in winter season, as it hydrates my skin. After my skin is hopefully clear from clogged pores in the future, I am planning to keep using a 10% urea lotion just for keeping my skin hydrated. So if it appears to be keratin blocking my pores, what causes it? Dry (indoor) weather conditions are mentioned and I suspect having treated my skin too harshly in the past (which also did dry out my skin). It seems to me that dry and flaky skin can cause a buildup of keratin that can clog pores. Looking at my positive experience I would not be surprised if not more people could benefit from using a cream with urea (in combination with salicyclic acid). It even makes me wonder why creams with urea are not prescribed for acne and/or clogged pores (after all, dead skin cells clogging pores are mentioned as a cause). If someone wants to try it, I recommend starting with using a lotion or cream with a urea concentration of 10% and if that does not irritate try a cream with a concentration of between 20% and 30%. The keratin plugs are caused by fungus - malassezia or candida (or more strictly, the response of one's immune system to the fungus). So, yes one can (partly) get rid of the keratin plugs using urea and/or salicylic acid to dissolve the keratin, but the keratin plugs/nodules will come back if one does not get rid of the fungus. Hi @Aussie Scientist how would you get rid of the fungus? Do u think one could develop this while on accutane? I am getting 2 bumps cut out and tested with what is suspected to be osteoma cutis..
Have you been taking antibiotics along with the accutane ? Antibiotics cause candida and/or malassezia in otherwise healthy people. Note that many doctors are in denial about candida and malasezzia (usually caused by antibiotics) in otherwise healthy people. Do NOT take antibiotics unless you have a life threatening bacterial infection which cannot be controlled by topical means. The bumps are most likely keratin nodules, which are caused by your body's immune response (in your skin) to the fungus. One should look for the simplest explanation first. Osteoma cutis is fairly rare and is very rare in young people. Keratin production in follicles in the skin in response to infection or other skin damage is fairly common, and can occur at any age. If you have a white tongue, skin pustules, infected and/or ingrown hairs, an itchy or painful red rash, "pimples", and possibly gut problems, unexplained tiredness, feelings of disorientation, and you have taken antibiotics, then you most likely have candida. 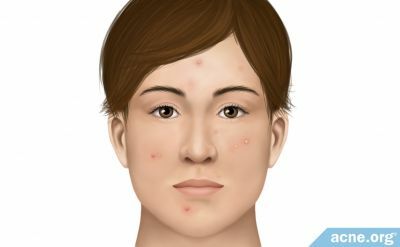 If you have dandruff, flaky skin, skin pustules, ingrown or infected hairs, "pimples", and possibly seborrheic dermatitis and you have taken antibiotics, then you most likely have malasezzia. Both candida and malasezzia are fungi (sometimes called yeasts). The best treatment for malassezia is terbenafine cream (sold as Lamisil in some countries), plus washing with a shampoo with climbazole (not to be confused with clotrimazole) in it. Mustela Foam Shampoo for Newborns is good - this is very gentle and you can leave it on your skin. You can dab some tea tree oil or eucalyptus oil on spots with a q-tip (cotton bud) - this might sting a bit. Do NOT use moisturiser on your skin - malassezzia feeds on the organic oils in moisturisers, and both candida and malasezzia love moisture. Keep your skin dry. Do not touch your skin where the outbreaks are without twice washing your hands first. Keep a special towel (or use disposable paper towels) to dry the affected areas and wash the towel every two days or so. NEVER touch your nose and then touch your skin - most people carry staph in their nose and getting a secondary staph infection on top of a primary fungal outbreak is a nightmare. Wash the affected areas with chlorhexadine wash (Hibiclens in the US), and then apply the shampoo with climbazole if you have malasezzia. If you have a gut problem with candida - symptoms are irritable bowel, tiredness, feelings of disorientation, headaches, then reply to me and I can provide advice on how to get rid of candida in your gut with oral nystatin (Nilstat), which is quite safe. I am not a medical doctor, and thus I cannot give formal medical advice. Notwithstanding that, the above information is based on 2,500 hours of reading scientific literature about candida and malasezzia, and on my own considerable experience. This is really interesting as I think I may have the same condition. Do you mean clear/white bumps under your skin and if you squeeze them it comes out like a string like paste? Or sometimes a hardened seed like thing? I have been using SA, BP and tretinoin (along with other things) but I still find that they build up after time. About every month I go to a skin place to have them extracted. They steam my face and squeeze them out. Sometimes they get infected and turn into a huge cyst/pimple. I don't use antibiotics regularly, only when I get sick but I do have a white-ish tongue. I take probiotics and other supplements daily. I will have to give this a try if we are talking about the same thing. Yes, candida and malasezzia cause hardened seed like things and sometimes stringy white exudate. The hard, seed like things are keratin, which is an immune response of one's body to the fungal infection. If you have a whitish tongue, you most likely have candida. I see you are in Australia. Thus, I suggest you buy mycostatin cream at the chemist (it is on the shelf in the ant-fungals section of chemists). Not all chemists stock mycostatin, but some do. Canesten cream (which contains clotrimazole) may also help. You can see which one works the best. I would also spray your skin (for a few days only) with SOOV burn spray - again you can buy this off the shelf at chemist (not all chemists stock it, but most do). SOOV burn spray contains lignocaine/lidocaine and will help calm any inflammation. And lidocaine/lignocaine is mildly anti-fungal. The SOOV spray will also help prevent any secondary bacterial infection. You can apply mycostatin cream and/or canesten (or other clotrimazole cream) to your skin long term. They are both quite safe, when used topically. I have two problems. The first is large red lumps that appear occasionally and seem to be filled with fluid and blood, and last a long time. The secondary is the white bumps under my skin. Are you saying antifungal creams will dissolve the bumps when applied to them? Or are you suggesting I apply it all over my face regularly to prevent further ones? Are the red lumps related? I've tried everything on the lumps and nothing seems to work however I started using Hydrozole that I had at home, which is hydrocortisone and clotrimazole, on an active lump and I may have seen some improvement. Are you saying I should replace my skin care regimen with just anti fungal cream? ... The secondary is the white bumps under my skin. if the white bumps are caused by hard transparent/whitish pieces or seeds than it could be keratin plugs (your nails and callus areas are also mainly keratin, so similar color). Keratin can only be dissolved by urea (in 20%+ concentration) or salicyclic acid. The advantage of urea is that it hydrates the skin as well, the skin produces keratin when it's dried out or damaged, and salicyclic acid products can dry out the skin in my experience. Reply to GettableGrate. You should use an antifungal cream (start with clotrimazole cream) as well as salicylic acid/urea on the affected areas. You need to stop the cause of both the large red bumps and the white bumps. The cause is most likely fungal. If you have a white tongue, then the cause is likely to be candida. If you have dandruff, then the cause is likely to be malasezzia. Both of these are fungi. Outbreaks of malasezzia and candida are caused by taking antibiotics. Get back to me if the clotrimazole does not work, and I will provide information about the specific antifungal creams to use for malasezzia and candida. Clotrimazole is a broad action antifungal. You could/should apply 0.5% hydrocortisone cream or 1% lidocaine/lignocaine cream for up to a week, together with the clotrimazole antifungal cream. Keep applying the clotrimazole cream long term - antifungal topical creams are safe. Don't apply hydrocortisone cream or lignocaine/lidicaine for more than a few days at a time. Thanks Salinas and Aussie Scientist. Salinas, are you still having success with urea? There are no good urea products in Australia. I found one in the States which has 3% salicylic acid and 20% urea. So I'm thinking I can replace my salicylic serum with this. Only thing is it will cost over double the price of the product to have it sent here. Aussie Scientist, I went to my GP yesterday about my current red lump and she said it definitely wasn't fungal. She thinks it is just a badly infected pimple/cyst but was unable to help any further. I did ask the chemist about mycostatin and was told they don't stock it anymore but they had some vaginal cream which had the same ingredients. So after a bit of a laugh I bought it. I then applied Hydrozole along with the vaginal cream onto the lump but there was no improvement. I currently use a gel called Akerat 30 (from company called Eau Thermale Avene) that contains 30% Urea and salicyclic acid. It works very well for me, I can feel it is slowly dissolving all the hardened stuff which I assume is keratin underneath my skin. The product is sold as ''gel for keratosis prone and scaly skin''. The 3% salicylic acid and 20% urea product you mention sounds good to me, that is if you believe your skin is clogged with keratin. Note that keratin is hard, so not like paste (that is probably sebum). It's unfortunately not that easy to find over the counter products with urea above 10%, but although creams with urea 5-10% are great for your skin in my experience, they are not strong enough to break down the keratin build up in my skin. Maybe try amazon. hi guys, i just read through the whole threads damn i think im having the same issue here. i have white tongue, hardened sebums on my nose and chin areas. but my nose and chin usually get oily really fast even after i just washed them. if i stay in a cold room it will be flaky and dry instead.. i had some on my cheeks as well but after i extracted them they dont seem to come back touch wood.. but the nose and chin areas always come back after a day or two at most. Note that keratin is hard, so not like paste (that is probably sebum). Damn, sounds like I have a different problem then. Even though I get hard seeds, they are soft on the inside. Chrishank, that sounds similar to me. whatever your skin issue, the main thing I learned is not to dry out your skin. This causes all kinds of problems, including clogged pores as it messes up your normal skin shedding proces. Creams or lotions containing urea are still good as urea is a natural skin hydrating substance. I wanna try this product but it will cost about $70 to have it sent here, or 2 for $100. I'd pay it if I knew it would help. It sounds good because I might be able to replace my salicylic acid serum and moisturiser with it. Your GP may be right, but she may not be. Doctors routinely fail to diagnose skin fungal infections. They are not trained to recognise skin fungal conditions. I am not saying that you have a fungal condition - of course, I cannot say that. BUT - if you have a white tongue and/or dandruff/flaking skin , red bumps, skin nodules etc., and you have taken antibiotics then you very likely have a fungal condition (candida if a white tongue, and red rash, nodules, bumps etc. ; malasezzia if dandruff, flaking skin, nodules, bumps etc.. From what you have said, malasezzia is more likely than candida in your case. One has to apply antifungal cream for several days or longer to control candida or malasezzia. The vaginal nystatin cream is about 10% of the strength of mycostatin, so it may not work. And, Nystin ONLY control candida. Nystatin does NOT control malasezzia. If you have a white tongue (indicative of candida), I strongly suggest that you go to another chemist and get some mycostatin cream, or you you can get it online in Australia, and apply it to your face. Howevever, from what you have said, I think you have an outbreak of malasezia, rather than of candida. If you have dandruff/flaky skin, I strongly suggest that you apply lamisil (terbenafine) cream to your face. Nystatin (the vaginal cream) will NOT control malasezzia. Hydrozole will not necessarily do anything for candida or malasezzia. They are often resistant to miconazole. Also wash your face in chlorhexadine wash, which you can buy at chemists or online in Australia. This is critical to prevent secondary bacterial infections which can be very dangerous (staph). Never touch your nose and then touch your face without twice washing your hands. Always, wash your hands twice in antibacterial handwash and/or chlorhexadine wash before washing or touching, your face. Ask me for details of chlorhexadine wash, if required. You can grind up aspirin tablets and put them in urea cream, if you wish to use urea/salicylic acid cream also. Do NOT use moisturiser on your skin, as moisturiser feeds fungus. What you do is your call, but why not try using topical lamisil (terbenafine cream) - cannot do any harm and is cheap for one tube. Malasezzia can become very nasty - deep cysts that are VERY hard to get rid of - if left untreated. Candida is worse. I won't bother you again, unless you get back to me. I don't have dandruff or flaky skin, and I haven't been taking antibiotics. Right now my skin is basically clear except for one big red bump that I've had for 9 days and has not improved much. It now feels solid/hard but there's never been a sign of it coming to a head. Salinas, sorry to hijack this thread. I just wanted to hear more about urea. If your skin is clear and you don't have flaky or very dry skin, I wouldn't spend that much money on a 3% SA and 20% urea cream as this strength is too solve a skin problem, not for daily use. For daily use maybe try to add or exchange your SA serum for a 10% urea lotion, assuming this is for sale in your country, as urea hydrates your skin while also exfoliating it like SA does.